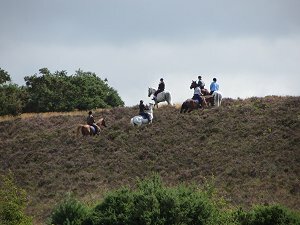 Our first walk was on 15th July 2012 and was a bit quiet. We had just five people on it. This was partly due to lack of publicity. Our website stopped working the day before the walk! I had a couple of phone calls from people wanting to go to the walk but unable to see the details, so I was able to tell them where to meet up. Also we weren't yet on the Group-Finder or Walk-Finder pages of the Ramblers website. Anyway, the walk went well and the weather was a mixture of sun and cloud, but it didn't rain! The paths were not as muddy as we'd expected, considering the amount of rainfall in the preceding weeks, but some were a bit overgrown. The walk took us along the Lambourn Way and then up onto the undulating Eastbury Down and gallops. We stopped off for a pleasant drink at a pub at Eastbury and then returned through farmland, stopping again for a late picnic lunch. See the route on Google Maps. Our second walk was better attended with ten people on it. 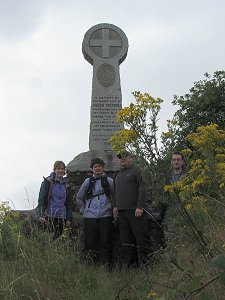 During the week before this walk, our website had been fixed and details of our walks had been added to the Ramblers website, which helped a few more people find out about us. Also the weather was nice and sunny but not too hot to walk. The title of this walk was a bit misleading as the route did not include Walbury Hill. 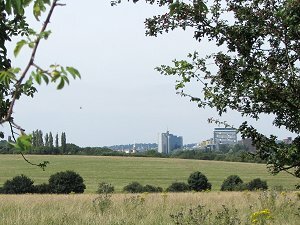 Instead it included nearby Hamstead Park, which was very picturesque. After an early picnic lunch, we stopped off at a pub in Hamstead Marshall for a drink before walking through Hamstead Park and then back along the Kennet and Avon canal. 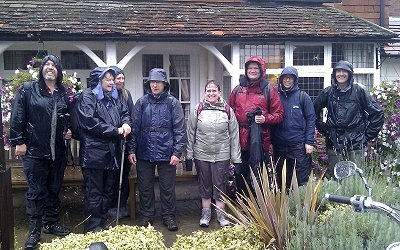 As the weather still very good once the walk was over, some of us stopped off for another drink in Kintbury. See the route on Google Maps. 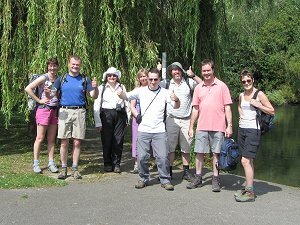 Eight of us attended our third walk on 29th July. The weather was good except for one shower that started just before we got to our pub stop. The walk first headed north-east out of Stoke Row and cross country to Highmoor, Holly Grove, Satwell, and Kingswood Common, where we stopped for our picnic lunch. On the way we passed a number of country pubs that had closed down. This is becoming an all too common site these days. After lunch we continued through a mixture of woodland and open countryside on our way to Checkendon, where we stopped off at a pub. It began to rain minutes before we got to the pub but luckily it had stopped by the time we left the pub to continue the walk back to Stoke Row. On the way, we made a slight detour to look at the Maharajah's Well - commissioned by the Maharajah of Benares in 1863. I tried to record the route of this walk with my GPS receiver, but something went wrong. I only recorded half of the walk! Finger trouble, no doubt. 4th August: Either the weather forecast put people off or everyone was watching the Olympics but the turn-out was low on this walk - only four of us today. Most of the rain came and went before we started, with only one shower after we set off. In fact it was quite sunny for most of the walk. 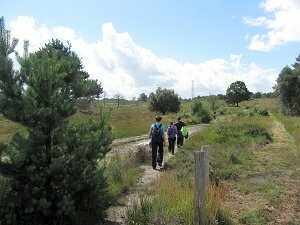 The walk was mostly through heathland and occasional woodland. Starting northward to visit the Queen Victoria monument, the walk then headed south, crossing over the M3 motorway at Long Cross, to Albury Bottom and Butts Hill. After a picnic lunch we stopped off at a pub in Burrow Hill before making our way back to the starting point, this time going under the motorway near Staple Hill. As there were only four of us and we were all experienced walkers, we made good progress with a brisk pace averaging at over 4 mph! Unfortunately I haven't got the route recorded for this walk, or the previous walk, as in both cases only the first half of the walk was recorded. 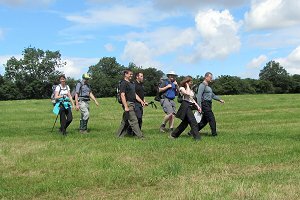 On 11th August our fifth walk was a mixture of urban walking and country rambling that mostly follows the Basing Trail - a Heritage Trail around Basingstoke and Old Basing. The weather was excellent! Quite warm but not humid with a refreshing breeze. I think this helped boost numbers as we had ten people on this week's walk. 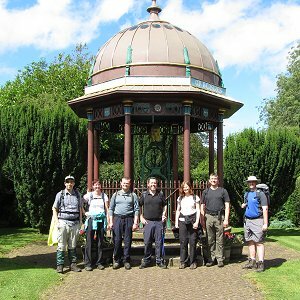 We started the walk at Basingstoke railway station and walked through the town to the War Memorial Park. From there we headed off past the sports fields and through the smaller park at Black Dam into the Crabtree Plantation - a strip of park land sandwiched between the A30 and M3. After that we crossed the A30 into Basingstoke Common and on to picturesque Old Basing. We stopped for our picnic lunch at the site of Oliver's Battery before continuing to the Millstone pub for a drink. 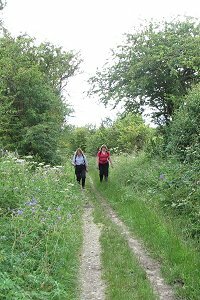 We headed back following the River Loddon as far as the Tithe Barn, then cross country past the Amphitheatre and back into Basingstoke. On the way back to the station we passed through Eastrop Park, with its miniature boating lakes and crowds of people enjoying the weather. We stopped there for an ice cream before the last leg of the walk. One or two of our number departed before we reached the station to take advantage of the shopping centre. Now I've got the hang of my GPS receiver, I've been able to record the route we took. See the route on Google Maps. 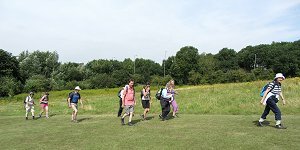 Nine people attended our sixth walk on a scorching August Sunday. Temperatures reached 28°C in the afternoon and with over 300m of ascent (not all at once) it was quite a day, but the excellent views were well worth the slog. We started by heading eastward and upward from Adbourne, through Ford Farm toward Baydon Manor. 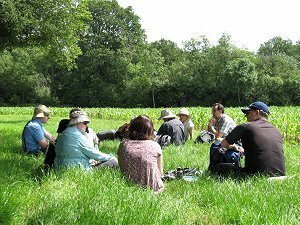 Next we headed down to Crowood Farm and then on to Ramsbury, finding a place in the shade to stop off for our picnic lunch on the way. After spending the best part of an hour taking refreshment and relaxing in the garden of a pub in Ramsbury, we set off back to Aldbourne. 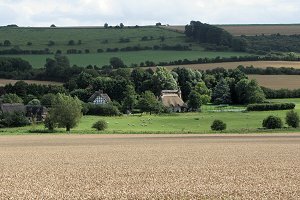 The return journey took a more direct route that headed north through Love's Copse and Southward Down before descending into Aldbourne. Just as I thought I'd mastered my GPS, I made a school-boy error. The battery went flat during the walk because I hadn't recharged it recently! Luckily a new member of our group had recorded the route on his phone. Thanks Mel. See the route on Google Maps. 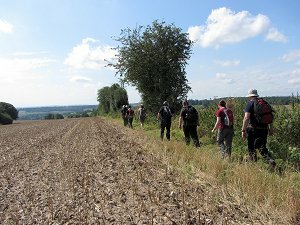 Sixteen people attended this walk, held jointly with the Berkshire Walkers 20s and 30s group on this August bank-holiday Sunday. The weather was surprisingly good compared with the rest of the bank holiday weekend. 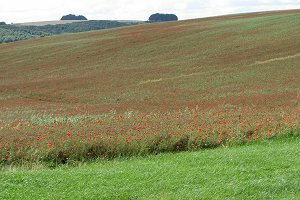 We started off from the big car park near Barbury Castle and headed off east along the ridgeway path. This runs along the top of Smeathe's Ridge for a while, giving excellent views into the valley of Ogbourne Down. 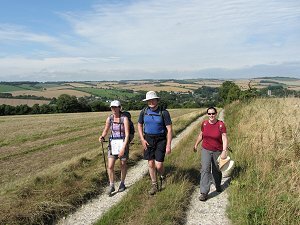 The path then starts to descend from the top of the ridgeway down the north side, giving views of the hills between Ogbourne St George and Aldbourne where we walked last week. We followed the path to Ogbourne St George and then southward to Ogbourne St Andrew. On the way we passed a tiny hamlet called Southend, with thatched cottages and a tennis court. We often see private tennis courts on our walks but none of us have ever seen anyone playing in them! We stopped for our picnic just before we got to Ogbourne St Andrew and then stopped for a drink at the local pub. After that, we set off out of the village in a north-westward direction, following bridleways, footpaths and byways. 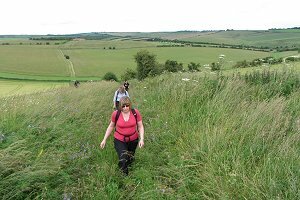 On our way back up to the hill top fort of Barbury Castle, some of the paths were quite slippery with wet chalky clay (from the previous day's rain). There used to be a little farm cafe at top where we have stopped on previous walks, but sadly it looks to have been destroyed by fire and is quite derelict now. We found an Ice Cream van in the car park, and after our refreshments some of us went and explored Barbury Castle. It is basically the earthwork remains of an Iron Age hill fort dating back 2,500 years. Have a look at the route on Google Maps and also take a look at the hill fort earthworks to the west of the car park. We had fifteen people on this joint walk with the Windsor and District group. There was just a hint of Autumn in the air for our first walk of September and there was a drizzle of rain through the first half of the walk. From Tylemill Bridge we followed the tow path along the Kennet and Avon canal to Sulhamstead Lock where we headed off into the countryside around Sulhamstead. On our way we came across the ruined St Michael's church at Meales Farm. Only the front porch and a crumbling piece of wall still remain. It's quite an odd site as the porch and its door are both in very good condition. 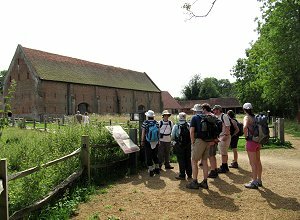 We continued to Ufton Nervet and on to Ufton Court before stopping for our picnic lunch outside the church as Padworth College. 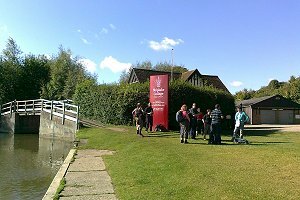 After lunch we headed off to Padworth Mill where we crossed the weirs and carried on to Aldermaston Wharf where we stopped for a drink at a local pub. Refreshed from our drink we followed the tow path on the canal as far as Froude's Swing-bridge, where we diverted to Padworth Bridge. From there we took a route that ran more-or-less parallel to the canal through Uftongreen Farm and back to where we started as Tyle Mill Lock. See our route on Google Maps. Eight attended the walk on Saturday 8th September. Numbers perhaps were reduced due to the Peak District weekend away. The weather was bright and a warm 24°C. From the Rowbarge Inn car park we headed east along the Kennet & Avon canal tow path for a couple of miles to reach the Aldermaston wharf. 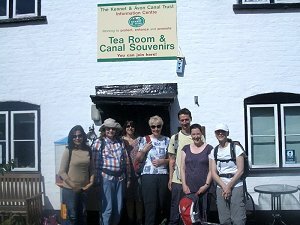 We visited the Kennet & Avon Tea Room where we had drinks and (for some of us) a cake. After the refreshment stop we headed north across the A4 heading up hill to St Mary's Beenham Parish church, where we stopped for a few minutes to view the flower arrangements in place for a wedding. 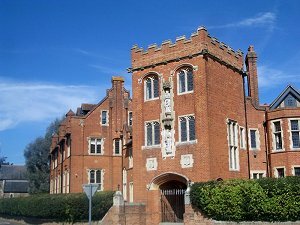 Next we progressed to the outskirts of the Beenham village and then west reaching Upper Woolhampton and Douai Abbey where we had lunch overlooking the tennis courts in bright sunshine. 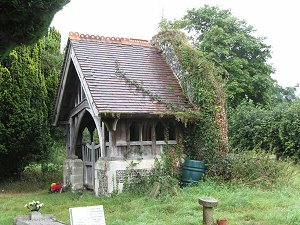 Lunch was followed by further westerly travel through some woods and open fields before crossing the scenic Midgham Park to St. Matthew's Midgham Parish church. Our return was completed by crossing back south of the A4 and re-joining the Kennet & Avon canal for about 1½ miles easterly arriving back at the Rowbarge Inn for a well-earned drink. No GPS route was recorded for this walk. Not my fault this time as I wasn't there. Mike is still learning to use his GPS receiver! The photos and description were provided by Mike, the walk leader. I didn't make it to our tenth walk but I'm told that 27 people attended! 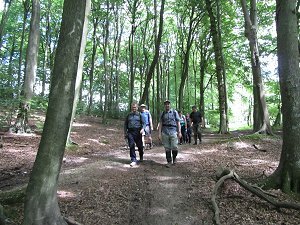 This was helped by offering this walk as a joint walk with the Chiltern Weekend Walkers, who are a much more established group than us and made up the majority of the attendees on this walk. 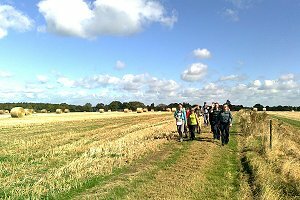 On Sunday 23rd September, our eleventh walk started off with nine people and ended with four! No, this isn't due to some disaster. 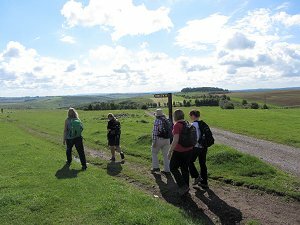 This walk was a figure-of-eight walk that allowed people to do just a 6 mile walk or the full 10½ mile walk. In this case the weather was the reason for most of those that cut their walk short. The rain started before we set off and got steadily heavier as we walked, with no let-up until the afternoon. 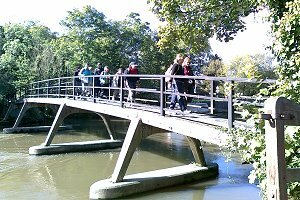 We started the walk at Odiham Wharf car park and followed the Basingstoke canal (going east) until we had looped around Dogmersfield. 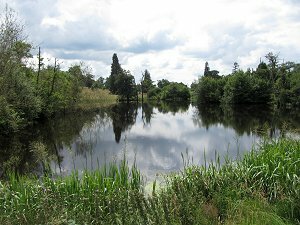 We then left the tow path and passed Tundry Pond on our way through Dogmersfield Park. Then we passed Dogmersfield Lake before rejoining the canal going west. 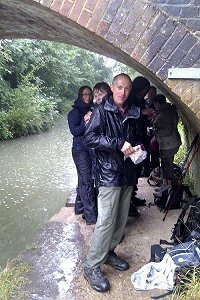 We sheltered from the rain under a bridge over the canal to have our picnic lunch. It was rather cosy but at least our sandwiches didn't get soaked. We then continued along the tow path, passing the start point of the walk, on to the pub. After much appreciated refreshment, the group split. Some went back to the car park while the rest of us continued with the second half of the walk. The rain stopped on the second half of the walk. We followed the canal as far as the Greywell Tunnel. Along the way we stopped off to look at Odiham Castle (built 1207-1214) and we had a look at the aqueduct that allows the River Whitewater to pass under the Basingstoke canal. The water is very clear at the Greywell end of the canal and we were able to see quite a lot of its aquatic wildlife. 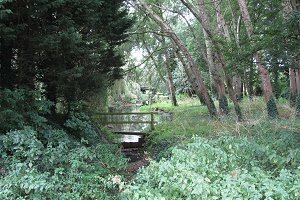 We returned along the tow path with a diversion through Warnborough Green, allowing us to see the ford across the Whitewater. See our route on Google Maps. The photos were kindly provided by Mel, a newcomer to the group. 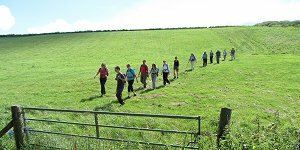 Our twelfth walk was on Saturday 29th September and had thirteen people attending. The weather was good - warm in the sun but with a slight autumnal nip in the air. This was an easy 6 mile walk billed as a good walk for newcomers, and we did have several newcomers. 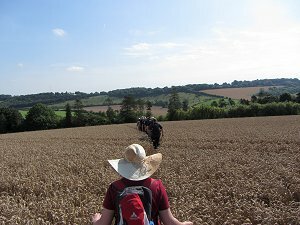 The walk started from the car park of the Flowing Spring pub and followed Spring Lane to Sonning Eye where we crossed Sonning Bridge to join the Thames path. We followed the tow path along the Thames towards Shiplake, passing Hallsmead Ait (an ait is a small island) to the Shiplake College boat club. After that, we left the tow path and took the steep path up to Shiplake. We walked through the village before going cross-country through Shiplakecourt Farm, Shiplake Rise Farm and Shiplake Copse. We stopped for our picnic lunch at the edge of a recently harvested wheat field just after Shiplake Copse. 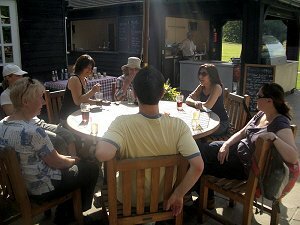 After lunch we passed through a small hamlet at Binfield Heath before following a footpath through Bint's Farm back to the Flowing Spring, where we stopped for a drink and continued to enjoy the Autumn sun in their beer garden. See our route on Google Maps.